Love the look of this wall sculpture. Its the perfect replacement for a picture. 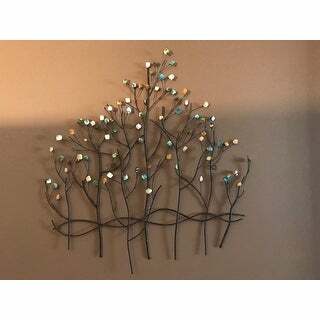 Fits great on walls in a narrow hallway The quality is great for the price. Transform any space in your home into a fairy land with this gemstone forest sculpture. 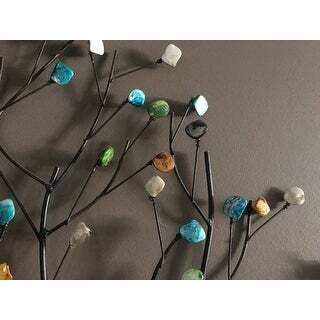 The bronze trees are topped with glass stones in many different colors for a fun and fanciful look, and the sculpture is lightweight and easy to hang. Dimensions 2.75 In. X 32.5 In. X 32.0 In. I love this wall sculpture! I looked for a long time for a larger piece to go in my master bathroom, and this is the perfect piece! I read many reviews that had said many of the gemstones had fallen off in shipping, but mine came completely intact. We also had no problem hanging it. The gemstones are very pretty and the colors were very accurate to the picture on the website. I would recommend this to anyone looking for a unique looking piece of metal artwork that works in any room! This piece of art is about 30 inches wide and 24 inches tall. 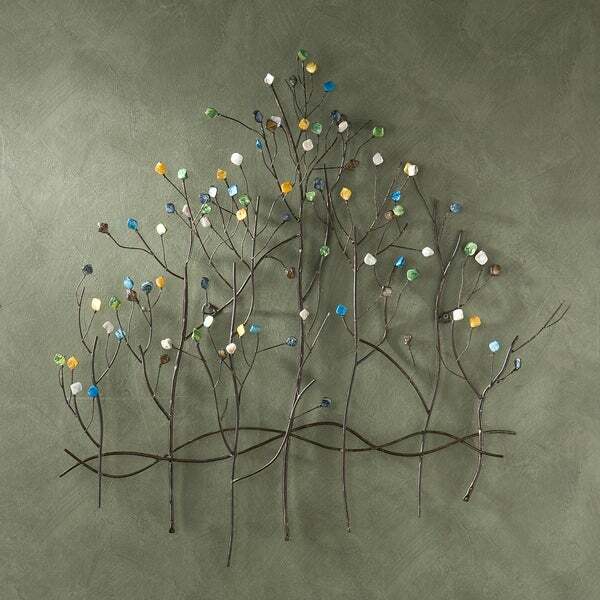 The branches on the wall sculpture have different color stones. When the wall art arrived, several stones had fallen off. I was able to bend and twist the metal to put the stones back on the branches. 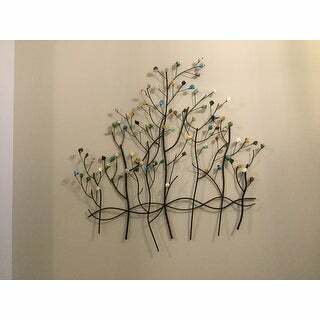 The wall sculpture is nice but you would need something else on the wall to make this art stand out. Almost bought this same thing from home decorators then saw this price and canceled my order just in time! 2.95 for shipping here and no tax and about $40 less!!! cant be beat, great job Overstock.com :) As far as the product goes, no stones missing or off, very pretty. 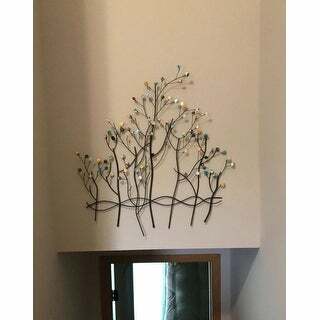 only thing that may be an issue is the triangular holes used to hang, are attached to the branches and it does not lie even on the wall, so I think we will have to bend the metal a bit to have it lie flat to screw on, aside from that, love it! I've seen metal sculpture for walls. Most of it is pretty tacky. This sculpture is a cut above. The stones in particular are quite nice. They are like polished rocks, not like shimmery gemstones. It's a good look. The piece arrived with several of the stones broken off. But there are so many that I'd be hard placed to figure out where they were missing from. The piece sticks out from the wall about 2 inches. A nice look. One difficulty is hanging the piece. The directions say to sink a couple screws into the wall. After a visit to Home Depot, I found some molly/screw combination with screws that were long enough (essential) that they would stick out of the wall enough that they could reach the loops. You need to be a little handy to hang this thing. Once up, I'm enjoying it. This sculpture is great! 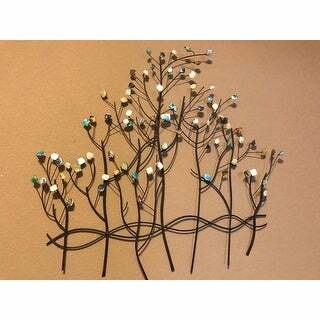 I has wonderful stone accents paired with an artistic metal forest sculpture; a perfect combination that will complement any wall in your home! We were looking for something to hang on our wall and came across this design. Most of the metal wall art out there is cheap and cheesy. This one is nice and isn't over the top. The reason I gave it an "average" rating was that the soldering on one of the metal pieces came apart. It wasn't anything noticeable when it's on the wall, so I didn't bother to return it. But overall, I'm happy with this purchase. I needed art in our entryway but didn’t want to go with traditional wall art. The colors in this wall sculpture were perfect for our decor. The item came packaged well and the sculpture was not damaged in any way. It came with hanging instructions, wall anchors, screws, and additional gemstones to use as replacements if needed. It is light nd was easy to hang. Love it! I purchased these for a staging job, and it was just the art piece I was looking for. I was fortunate to find one in another size to make a big wall collage. Fun colors and adds some punch. You can tie in many different colors with it. This arrived in great condition, only one 'jewel' had fallen off and was easily reattached. It was easy to hang. The colors blend perfectly with the pale lavender walls, purple bedspread, and teal accents in the bedroom. It was just what I was looking for. One caveat: although the dimensions are accurate, they are a bit misleading. 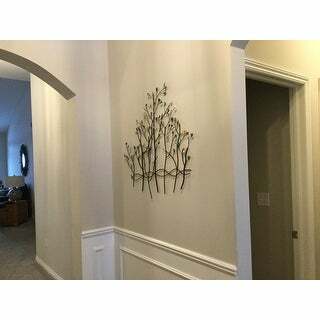 The width is to the tips of the widest branches so it appears smaller on the wall than I had imagined. I wish there were matching items that might go on either side to make it appear wider. I like the forest wall sculpture - it looks great! thanks! UPS delivered product today, It was poorly packed with one layer of thin bubble wrap on one side only. Arrived with a piece broken that we will weld back together rather than wasting time returning. Box looked like it had been drug behind the UPS truck for a few miles. It may be metal but Overstock should take a little more care in how its packaged. Product itself is beautiful, looks like picture (except the broken tree we got). Good price. I put this above my stairs and it looks perfect. Everyone comments on how pretty it is too. This is one of my favorite pieces of art in my home, as it adds subtle pops of color and takes up a pretty large portion of an otherwise boring and blank wall. It is light enough to be hung on a straight nail that doesn't need to be secured into a stud, but heavy enough to stay put and not sway around if bumped into. The "leaves" are like little colored mosaic tiles. Very unique. Love this tree sculpture! Loved it! Fit the wall/decor perfectly! Makes a nice statement. This piece is perfect for picking up colors from lights. It was easy to hang and came with several replacement gems for any that might have been knocked off in transit. 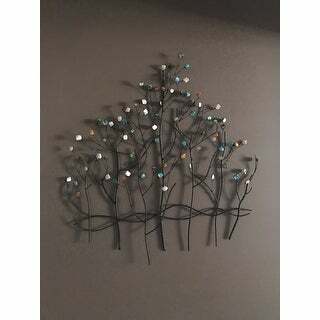 My husband and I hung it and both love the simplicity and hand-made appearance in our living room that contains several "tree" motif items. My neighbor complimented me on it as soon as she saw it! Love, love, love this sculpture. Very lightweight and easy to hang. Its a true statement piece. I plan to use the stone colors to pick up on when decorating since most of the house is grey. One of the branches broke off but its nit at all noticeable so I msy or may not try and glue it on. I like how they supplied additional stones as well. Love it! It’s different. Goes with my tree theme. Nice but definitely looks better on a color painted wall. Doesn’t pop against a white wall. Some of the gemstone were detached from the wire. Nice looking for the price. I absolutely love it...just what I’ve been looking for.And WOW what a bargain price..I will highly recommend Overstock.com and will shop there again. "Can I hang it outdoor?" It may rust,unless it is undercover. Or you can possibly spray it with a waterproof shellac. I think it would work outside. You may want to spay a clear coat but not absolutely necessary. I love mine, I cut it in half and used it on noth sides of a mirror. I'd be afraid that the gem stones would come loose and fall out. I wouldn't recommend hanging it outdoors. "I just received my tree and even just upon opening the box, there is a strong odor of formaldehyde. any one else have the same experience? the product listing does not say it has been certified to meet the minimum standards...."
"How much does this weigh? I am wondering if people have had difficulty hanging this because of its weight." It was very light and easy to hang. I did it myself. No... Not at all. It probably weighs 4 or 5 lbs. Its lovely! "What are the dimensions of this wall plaque?" Hello 461@, this is approximately 32 inches high x 32.5 inches wide x 2.75 inches deep. Thanks for shopping with us! "I was thinking of buying this for over my bed that is 6ft long.....wondering thoughts on buying two of them to place side by side. One will look out of place." Hello Annette N., two of these would work very well over your 6 foot long bed. Thanks for shopping with us! Price. I liked the colors and it fit the space I need it for. "Can I hang in yard?" No, this is designed to be used inside only.